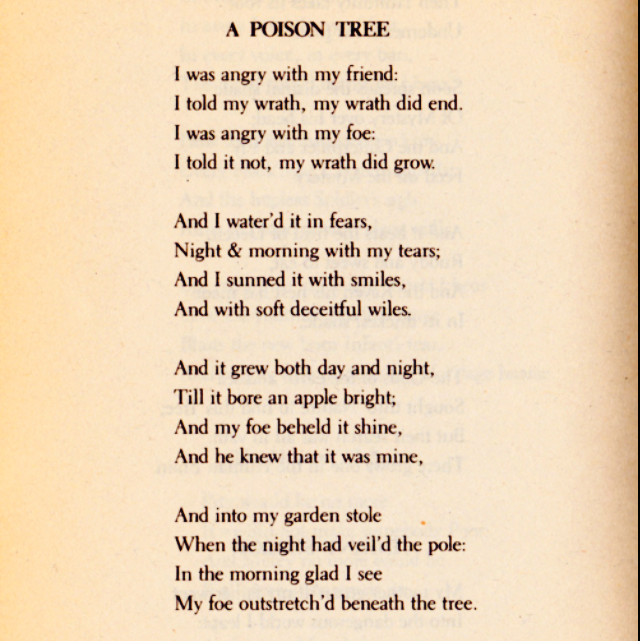 I think my favourite poem of all time has to be William Blake’s ‘A Poison Tree’. I still remember reading it for the first time; sat in Ms Darby’s English lesson, next to my dear friend Jenny, finding refuge from real life in dusty words stacked upon the shelf by our desk. I wouldn’t have been able to explain it then, I was too busy telling you how the world should be, but those words spoke to a part of me that I didn’t want to speak to myself and, once I had read them, I simply couldn’t forget them. Subconsciously, I have tried to forget these words. I rarely read them. I have tried to replace them with oh so many others. But they always seem to seek me out. I have always been an angry person. At least it think I have; I remember so little of my early childhood. Anyway, I struggle with my anger today. I feel this impossible heat rise up from somewhere in my stomach, maybe my soul, and fill every inch of me with an itch, a desire, a burning desire to speak to scream. The back of my throat contracts and I grit my teeth as I battle to silence myself. The tips of my fingers tingle and my muscles clench. My ears buzz. I feel powerful and weak and out of control. I cannot see reason.